Sisters from Canada, Latin America, and the U.S. discuss the day’s meetings with the help of a translator. For this event, the NGO sponsored four sisters from Latin America to spend a week in New York and attend CSocD. 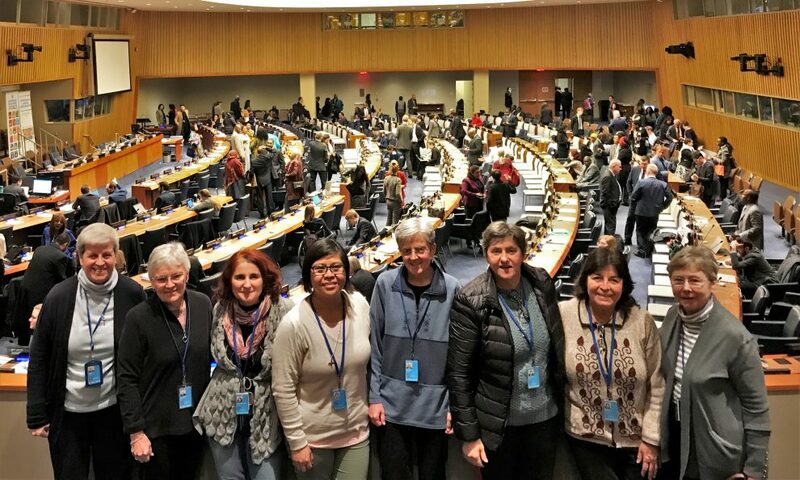 Sisters Nilva dal Bello (Chambéry-Brazil), Heidi Aguirre Enriques (Lyon-Mexico), Rita Bosch (Argentina-Buenos Aires), and Paulina Oviedo (Cuneo-Argentina) attended as representatives of the JPIC network of Sisters of St. Joseph in Latin America. Sisters Sue Wilson and Joan Atkinson (Sisters of St. Joseph in Canada) and Varka Kalaydzhieva from the justice office of the Sisters of St. Joseph in Toronto also attended CSocD. During this week-long immersion, the sisters attended daily sessions at the UN and had lively discussions during lunch and dinner about the day’s activities. These debriefing sessions served as an opportunity for the sisters to connect the day’s events with what the situation is like in their country. With the assistance of a translator, sisters were able to share their struggles and fears, while also discussing their hopes for positive change. Many of the sisters stated that these discussions were a highlight of their time at the UN and strengthened their connections to the global Joseph family. In addition to submitting a statement to the UN, the NGO had the opportunity to present an intervention and question during an interactive dialogue with senior officials of the UN system on the priority theme. Sr. Sue represented the NGO and addressed the trend of countries utilizing fewer funds to address inequality. She spoke passionately about the transfer of wealth and how this has left governments with fewer funds and fewer resources to address this growing issue. Additionally, Sr. Sue asked panelists to identify what governments are doing to fix these issues and what they recommend to ensure that social protections meet human rights standards. CSocD represented an important learning opportunity for the Congregations of St. Joseph NGO. In addition to the informative sessions at the UN, the in-between times spent with one another provided connections and hope for each of the attendees. 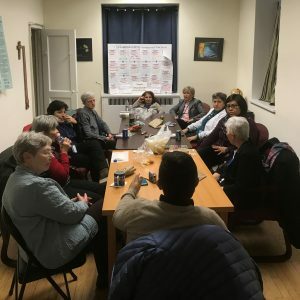 Though the sisters from Latin America are now back in their respective countries, the Congregations of St. Joseph NGO is working to ensure connections between the sisters and on-the-ground NGOs, who could benefit greatly from their informed input.